If the phrase 'getting away from it all' means anything to you - and you love world-class golf courses carved through spectacular mountainous terrain! - then a getaway to the picturesque Kokanee Springs Golf Resort should be on your bucket list. Featuring beautiful course-side accommodation, exceptional dining and a breathtaking Norman Woods-designed championship course that consistently exceeds expectations, the Kokanee Springs Golf Resort is truly a golfer's paradise in the Kootenay Rockies. Services: Power carts ~ club rentals ~ club storage ~ CPGA lessons ~ practice facilities ~ licensed dining lounge and patio ~ 10 km walking/biking trail ~ shuttle service. The Kokanee Springs golf course is carved from the wilderness and situated along the base of the Purcell Mountains. It is regarded as the flagship of golf courses in the West Kootenay area. The course features 66 sand traps, 12 water hazards and 124,000 sq feet of elevated, multi-leveled greens with 90,000 sq feet of terraced tee surface. If the hazards created aren't enough of a challenge, Kokanee Springs is a big course. The yardages are as follows, from the blue markers: 6,604, 6,260 from the whites and 5,747 from the reds. The Lodges at Kokanee Springs are situated on the course-side of this championship course. Located on the hill above the clubhouse between the tenth and twelfth fairways, the eight suites and 56 queen rooms allow you to relax in comfortable luxury. Spacious rooms with private balconies complete with bar fridges, coffee makers, satellite tv and air-conditioning. After a challenging round of golf, relax in the outdoor hot tub. Dining – Woods Pumphouse Grill serves contemporary, original dishes and has become more creative than ever. The menu includes a wide range of choices from burgers to sandwiches, salads and innovative entrees with vegetarian, seafood and poultry choices. Breakfast, lunch, dinner and Kids menu available. 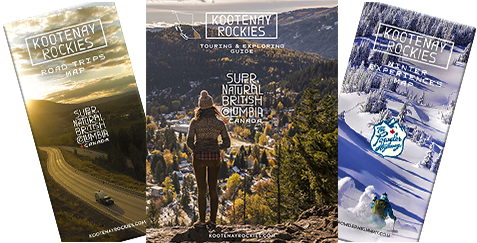 You will love the spectacular views of the Kokanee Glacier. It just does not get much better than this! A world-class golf course carved out of spectacular mountainous terrain. Getaway to picturesque Kokanee Springs. A breathtaking Norman Woods design. Swing into the Season with unlimited golf. Package price of $139/pp/day includes shared accommodation, unlimited golf, shared power cart and all the time and balls you want on the range. 1-800-979-7999. Valid April 20 to May 10, 2019. The Norman H. Woods Golf Lifestyle Experience starting from $999. Choice of 4 or 7 nights lodging, unlimited golf with shared power cart, all meals and much more. 1-800-979-7999 Valid for 2019 golf season. Classic Stay and Play package starting at $154/pp/day. Package includes 2 nights course-side accommodation, two rounds of legendary golf with shared power cart and more. 1-800-979-7999. Valid for the 2019 golf season.